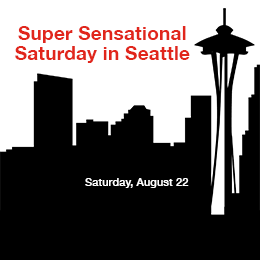 Don’t miss Super Saturday at the IDSA International Conference in Seattle, as we celebrate 50 years! Visit the Design Gallery and the IDSA Experience between 9am-2pm to see the IDEA winning products first hand; meet and engage with IDSA leadership, staff and partners. Pick up your commemorative IDSA 50th Anniversary pin; participate in our TOMS Style Your Sole activity; and take part in the Design Foundation Silent Auction. Hear from compelling speakers such as David Moinina Sengeh, a TED fellow who’s been honored on Forbes 30 under 30 in Technology; Patrice Martin, co-lead and creative director of IDEO.org; Bill Evans, IDSA, president of Bridge Design; and Kavita Shukla of Fenugreen. Mauro Porcini, IDSA, chief design officer, PepsiCo, Inc. Spend Saturday afternoon exploring Seattle. The Emerald City has so many options; we’ll give you a guide to help you get the most out of your day in Seattle--an exciting, walkable, urban city surrounded by unmatched natural beauty. See the city with ideas from the IDSA Seattle 2015 Host Committee. Super Saturday will culminate as we celebrate 35 years of the International Design Excellence Awards (IDEA). Which designs will take Gold? Join us for this red-carpeted, black-tie optional event. A ticket to the closing party–the IDEA Gala sponsored by Samsung–is included with your Super Saturday conference registration. If you can’t make it for the four-day conference, take advantage of Super Saturday. Day passes will be available onsite for $545.